As A Team captain from 2011-2015 ‘Widget’, brother of Jason, did a sterling job. Having led his team to promotion, contributing 213 runs and 18 wickets in his first season in charge, he produced an even better personal performance in 2012 with 334 runs and 18 wickets as his team just missed out on a second successive promotion. His efforts earned him the Player of the Year award. In 2013, with a much-weakened squad, he kept the A’s in Division 4 and, following an influx of new players, Melton A were the only undefeated team in the whole of the Alliance as they gained promotion to Division 3 as runners-up in 2014. In 2015 unavailability problems, mainly at 1st Team level, had a big impact on the A Team and, despite an excellent personal contribution from Lee (287 runs and 6 wickets) which won him the Player-of-the-Year Award, they were relegated back to Division 4. Lee has actually been with Melton since 2000 when he returned to Norfolk from Sheffield University. 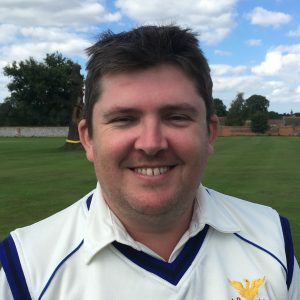 He opened the batting mainly for the A Team in his first few seasons but in 2004 he established himself as a First Team batsman scoring 285 runs at an average of 28.5 as well as playing a prominent part in the ‘firsts’ Norfolk League Plate victory over Old Catton. He continued as a first team regular in 2005, averaging over 20, but, since then, has played mainly for the A Team, with the occasional 1st Team appearance. Having previously captained Great Ellingham on a Sunday, Widge decided to play Sunday cricket for Melton in 2006 and captained the Mid-Norfolk League side for two seasons. Although he went back to Ellingham on Sundays in 2011, he swiftly returned to Melton. Not the quickest of runners nor the sharpest fielder in the club he, nevertheless, always gives 100% and his slightly ‘bent-arm’ bowling has bamboozled many an opposition batsman and proven to be a lethal weapon in the past few seasons. Often seen with ‘the Ginger Prince’, his other passions are football – he is an ardent Canaries fan – and Oasis as those on the 2005 Oxford tour will testify. Wearing his trusty parka and with guitar in hand, he took as through a full Oasis songbook in the pub garden at Wootton – and very good he was too although he took some stick for his morris dancer’s outfit! Widge is used to taking stick, though, usually for the state of his kit or the faddiness of his eating habits! Widge just loves his cricket, though, and is now 11th on the overall appearances list having played 445 games for the Club, scoring 7481 runs at average of over 20 and taking 126 wickets. Having stepped down as A Team captain in 2015, Widge enjoyed his cricket without the burden of organising teams, appearing regularly for the A, Sunday & Midweek teams in 2016 and occasionally for the Firsts.